As the costume master, it's your job to help bring the theater to life, but this opera is more than you bargained for. When a strange specter starts interfering in the last dress-rehearsal, it's up to you to stop it! Can you save the lead actress from a terrible fate, or will you join the haunted troupe as a permanent cast member? 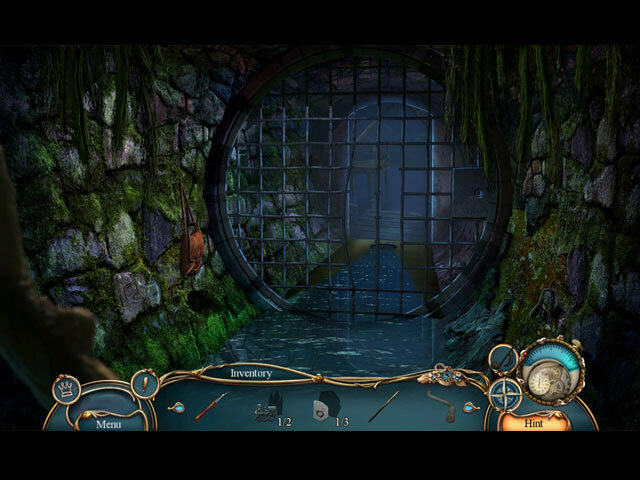 Find out in this chilling hidden-object puzzle adventure game! Danse Macabre: A Lover's Pledge is rated 2.7 out of 5 by 10. Rated 5 out of 5 by RPgames from Pledge to death Good game. I'm glad that I didn't get the collectors game buy this on sale for a good price. It did entertain me while I played it but not real exciting as some of the others. Not hard but I did use the hint button couple of times and puzzles and finding items was easy. Graphics were good but music was a little to much after a while because it was a short song with no change so very repetitive. I do enjoy this time period so I maybe nicer on comments . I gave it a 5 star since I don't regret buying it. Play before you buy it. Rated 5 out of 5 by chrisdroitwichuk from Don't miss What an excellent game. I thoroughly enjoyed the storyline. The puzzles and hidden objecst were well thought out. Long story especially for a standard version of a game. I thoroughly recommend. Please try. Rated 3 out of 5 by roaming from Some good stuff and some bad. Good stuff I liked: The artwork was clear and colorful if uneven in some scenes. Thankfully, there were no phony accents even though the game takes place in Russia. The hints and skips could be set to 10 seconds. Unfortunately, I was just getting interested in the story when the demo ended. Other stuff I could have done without: Running back and forth to the same locations multiple times damaged the forward progress of the story line. I get suspicious when this happens that there might not be much thought given to the story. I also would've liked to see some of the "that would never happen in real life" stuff paid more attention to, like hypnotizing someone with a few flicks of a watch on a chain while they're standing up in an alley. But at least it foreshadowed somebody has been playing mind games with our little dancer. I sometimes hate to recommend or not recommend, because everyone has different tastes. I think this one sits right about in the middle. Rated 3 out of 5 by PATinPNS from It's Not All Bad.. This is posted after playing the entire game. I think probably I'm being kind with thie review, but it really wasn't all that bad of a game. It kept me entertained for a cold FL afternoon and that's all that mattered to me. Yes, the quality, as compared to the other games in this series, was really low. I don't know if Eipix has a new set of designers or what, but it wasn't what I expected. I read so many reviews that were negative and I thought this is a great series. It can't be that bad and it wasn't. I did enjoy it. The biggest thing about the game were the graphics. They were really dull. I think the term cookie cutter would fit here. Normally I'm drawn to the graphics and will search each scene to see what all is there. Not with this game. A house was a house and a train was a train all with no frills. I didn't have a problem at all with the characters. I was surprised they were as good as they were. Voice overs were very well done. I do wish I had turned the music down a bit more. It started grating on my nerves. The map was a must. It was really difficult for me to follow where I needed to go next. It did a great job showing where there was something to do and then transported me there. Hidden objects were simple and unfortunately repetitious. By that I mean, find 3 of this and 3 of that. Not my cup of tea. The mini games were really simple. I did most of them and I know my patience level hasn't increased so I'm guessing they were easy. The story was well told. I didn't have a problem with it. The plot was easy to follow and I didn't get lost in the twists and turns. Could be because there weren't any I can recall. Give the demo a try. Keep in mind, this is not like the others in this series. If you do that, you might like it more. Rated 2 out of 5 by jessickamckenzie from Ugh.... I have never played this series, but I love Eipix games so I thought I would give it a try. I literally forced myself to play it. I switched the difficulty to easy so I could get through it as quickly as possible, skipping most of the game. Some were different and I liked that part, but even the HOP were pretty lame. I bought the one before this in the series (BOGO) so hoping that one is better. Fingers crossed! Rated 2 out of 5 by yowzasma from QUITE A DISAPPOINTMENT :( I have several of this 'Danse' series and most have been a pleasure to play and I was confident this one would be the same. This game turned out to be such a disappointment that I ended up mostly using the 'hint' button just to finish it and there were way too many mini-games for my likes. I looked at the reviews for the CE and they were far better, perhaps when downsizing it to SE version they took too much out [like the storyline]. This one in my opinion was a waste of my time and money that I could have been spent on another game : / 1&1/2 * out of 5* on my personal enjoy-ability scale. Rated 2 out of 5 by skullfun from ~~A LOVER'S PLEDGE IS IN NEED OF FINE TUNING!~~ Danse Macabre used to be an exciting series, with its sophisticated storylines and extravagant production. Things started to shift when Eipix chose to focus on quantity over quality when it comes to this once-promising franchise, A Lover’s Pledge is the third Danse Macabre game in 2017 – and the compromise shows. In this sequel, you play as a seamstress who was in the wrong place at the wrong time. You found yourself in the middle of a major drama when the lead actress from the opera show got kidnapped by a ghost, can you save her and yourself from this haunted theater? 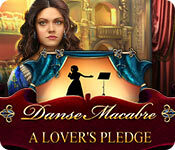 The storyline of Danse Macabre: A Lover’s Pledge is filled with HOPA cliches. From the vengeful spirit to the kidnapped performer, everything is just so predictable, even the alleged “twists” are not interesting anymore. 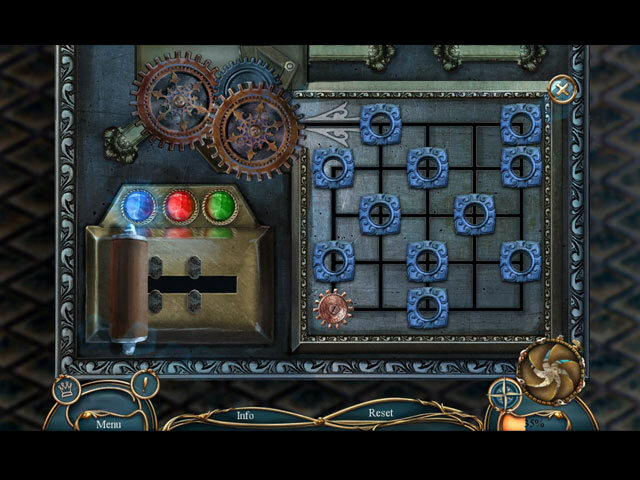 It is no surprise that the gameplay in Danse Macabre: A Lover’s Pledge is of the recycled type. While there is a lot of tasks and interactions to perform in each location, the challenge level is dumb down by how simple and boring these tasks are. Not to mention, that some tasks are far from being logical and that a few objects are placed in irrational places. Eipix is usually pretty reliable with its high production values. However, the sights and sounds in Danse Macabre: A Lover’s Pledge does not exactly impress. Even though the overall quality of the visuals is still high, the basic artwork and the washed-out colors are not to Eipix’s usual high standards. The background music is pleasant enough, but the voice-acting is sometimes slightly awkward and inappropriately dramatic. Rolling in at the three and a half hour mark, Danse Macabre: A Lover’s Pledge is a tad short of the standard length for a premium HOPA. I hope Eipix game developers will listen to reviewers so that this series continues...Cheers! Rated 2 out of 5 by Delorean01 from The dangerous spectre can destroy the opera with my blessing.. This game is dire...all the characters are wooden and lifeless, in fact, the game is soul-less.I was looking to play a free game on this first day of 2018 but even I couldn't do that...much happier resurrecting some of the great games from the good old days, particularly Witches Legacy..so good and well-made. Rated 1 out of 5 by pennmom36 from PHANTOM OF THE OPERA WITHOUT A PLOT When I played the demo in the Collector's Edition version, I was skeptical that the plot would thicken afterwards. I needed another game for a BOGO sale, and since I had already purchased most of the games this month, I decided to take a chance on A Lover's Pledge, after all, many of the games in this series are pretty decent. Well, I'm sorry to report, that after several attempts to finish this game, I simply can't do it! At first glance, the graphics appear to be stellar, but if you really pay attention to the detail, there isn't any detail. The buildings are plain Jane and basic, the decorations, shrubbery, plants and trees lack definition , the statues, the sky, the rooms, have no texture or intricate patterns to give them depth. A bell looks the same as a vase both in and out of my inventory. The objects within the HOP's are at times difficult to find, not because they are well hidden, but because it's hard to tell the difference between a scoop and a sickle, they are cartoonish looking and blurry. The biggest problem however, isn't with blah looking graphics, the problem is with the plot. Actually, I should say the lack of a plot, because this storyline is stretch far too thin. This is just another example of how 5 meaningless chapters, are far worse than 3 epic chapters. I kept forgetting what the story was about, and how this character related to that character, which is bad, really bad when playing a game that doesn't allow you to hit a rewind button! I gave up, perhaps too soon, but my intuitions say probably not. Just in case you may be able to stick with it, here's a recap of my review to help you decide which version, if either is right for you: This game is so boring I don't even know what the story is about! Through sheer boredom, I either muddled through the demo on autopilot, or they have done a terrible job of relaying the plot. A Lover's Pledge? I met two women and a ghost in the demo, Julia Belmont and Clementine Lambert. The third character, Andrea Belmont had already committed suicide, so who pledged their love to whom is a mystery to me! One things for sure, I'm a Master Costume Designer, how exciting. Danse Macabre is sliding down a slippery slope, one game at a time. The first few games in the series were really good, and they received a 4.4 average rating. By 2016 they slipped under the 4 star ratings, and by the end of 2017 the games are nearing the base of the slope as they dip dangerously close to average ratings below 3 stars. The truth of the matter is that this dev produces nothing but cookie cutter games, same story, same HOP's, same MG's, same Hidden Signs, same features, same graphics. Lover's Pledge has everything you'd expect, it's predictable, and it's just more of the same with a different title. Of course the Collector's Edition has 30 Hidden Signs, all Eipix games have Hidden Signs, and it's a feature that becomes so boring to look for after just a few scenes, that you don't care if you look for them or not. There's no challenge in finding them, they stick out like a sore thumb, and they aren't used for anything, they don't unlock special features, they just are what they are, "here's your sign". Other than a handful of Wallpapers and a Strategy Guide (which you won't need, it's an easy game) the only bling you get with the CE version are those not so hidden signs, unless you count a Bonus Chapter as a plus. 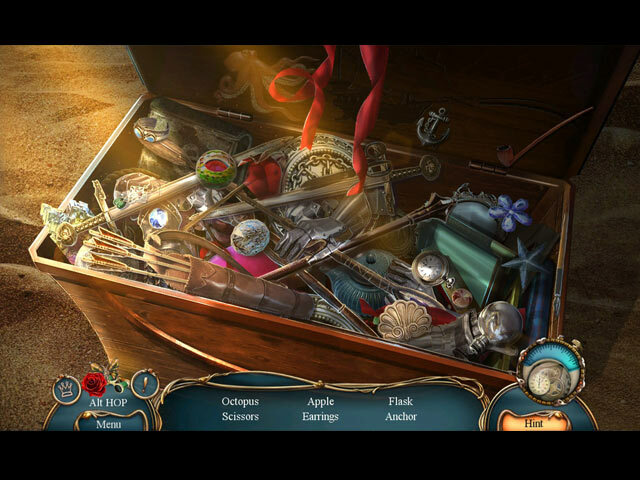 (which surely is just another chapter of boredom) The Hidden Object Scenes are located in boring scenes with boring items to search for. The only HOP remotely interesting, was finding multiples of objects that pertain to a riddle, at least you have to think about what you're looking for. There are the standard, Interactive List Finds, Progressive Interactive Silhouetted Shape finds, Multiples of Objects finds, and Riddle Description finds. Some of the HOP scenes are repeated in the same location, something Eipix never did before, but have been doing so in the last few games offered, a feature most gamers hate because it's too boring a second time around! The good news is that there is an alternative Match 3 game to play, the bad news is that it's not a great Match 3 game. The Mini Games are just okay, neither bad nor good, and certainly nothing new offered. Below are brief descriptions of some of the games you'll encounter during the demo: 1) Click on pie shaped sections in the correct sequence as demonstrated. 2) Guide the ball through the maze to the center using directional arrows. 3) Complete the decoration by dragging sections of the decoration to empty slots. 4) Move all tokens to the frame located in the center, by selecting numbered buttons on each row and column, to push the tokens a specified number of spaces on the grid. 5) Arrange the four colored switches between their matching circles on the right by dragging groups of switches along the wheel or across the bar. DANSE MACABRE GAMES AVAILABLE Title***Collector's Edition Release Date***Average Rating 1- The Last Adagio (February 20-2014) 4.4 2- Crimson Cabaret (September 25-2014) 4.4 3- Deadly Deception (February 28-2015) 4.1 4- Thin Ice (June 11-2015) 4.1 5- Lethal Letters ( February 11-2016) 4.2 6- Ominous Obsession (April 10-2016) 3.9 7- Florentine Elegy (April 1-2017) 3.5 8- Curse of the Banshee (July 20-2017) 3.0 9-A Lover's Pledge (December 2-2017) 2.7 The Collector's Edition has 8 Wallpapers (no concept art pictures??) 9 Music Soundtracks, 7 Movie Videos, 12 Achievements to earn, 21 re-playable Mini Games, a Souvenir Room, 18 re-playable Hidden Object Scenes, 30 not so Hidden Signs, a built in Strategy Guide and a Bonus Chapter.